Finding lyrics of a song is not an easy task to do, sometimes you get mad and frustrated. As for experience I sometimes get frustrated in such work. I've never heared of Apple's Shazam application, Ultimate-Guitar.com, Grooveshark.com or songtapper.com. But I like to in the future. I thought is a good site. I've never had a chance to shop for sheet music at local stores, or go to local establishments to see musical (or poetic) performances. I've never been to Calgary, but after reading this page I would like to visit the place and see for myself the place. I would like to experience what is like to live i Calgary. Barry's Response - Come in the summer sometime. During the Calgary Stampede. 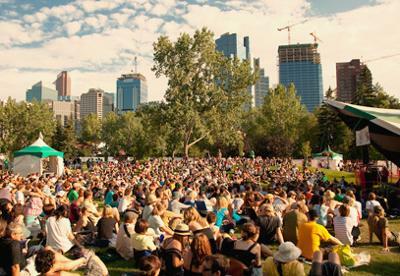 Or any of the other summer festivals taking place in Calgary for different types of music. Thanks June. Comments for Music, Lyrics and Calgary? For me finding lyrics by simply listening to the songs does the trick, but if i've listened to a particular song over and over again and can't decipher the lyrics i become frustrated and turn to the internet. I've heard of Ultimate-Guitar and actually use it on a weekly basis to find tabs for guitar. Though I generally use tabs I sometimes purchase sheet music of of amazon or from my local guitar center. Generally a try to see at least one musical performance a month, whether it by a local and or a larger act. I've never been to Calgary but this site entices me. Hopefully one day I'll be able to tour with a band a pay a gig there. I'm often pretty good at finding the lyrics to songs. I used to have a hard time until I found the site letssingit.com, where they 95% of the time have the lyrics I'm looking for. I've fine-tuned how I search for lyrics now, as you have to do it a certain way via google in order to get the results you're looking for. Sometimes I listen to music that isn't very mainstream, and it's sometimes harder to find the lyrics to such songs. I highly recommend the website I put above though. It doesn't have all those pop-ups that most other lyrics sites I've come across have. Also, you can search by artist, song, or by lyric, and often I will only know the lyric and have to search by that. I've never heard of the sites mentioned in this article though. One of my favorite things to do is to go to local venues for shows/concerts. Music is a very big part of my life. I've never been to Calgary, but I would definitely like to visit someday. I myself live in the U.S. and have only been to Windsor and Toronto. This webpage has inspired me to come visit the city someday.